In early 2006, I began a search for something new and exciting, as my children were getting older and more independent allowing me time to explore a new business opportunity! I have a background in raising horses, dairy goats, and dogs. I love animals and had recently gotten back into knitting, years after being taught how by my grandmother, Ida Lode. 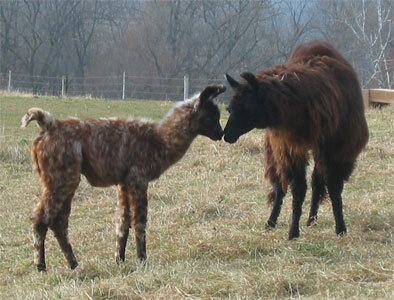 Initially I focused on other wooled animals, until I discovered - quite by accident - Mini Llamas! It may be hard to believe but it was LOVE at first sight! I knew immediately that this was my new endeavor!! Thank goodness for the many years of experience with other breeds and the knowledge of my mentor, Julie Chapman from Minnesota Minis! Here I am pictured with a few of my minis - Centennial, Bavarian Chocolate & Double Dipped. This is where I am the happiest, spending time with my animals. 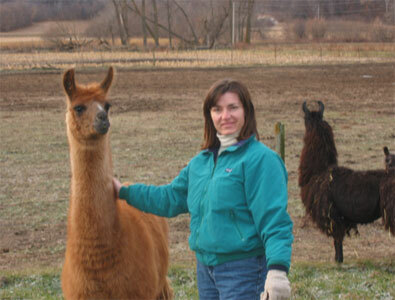 You would be amazed at how the calm and quiet of llamas is able to lend a feeling of relaxation. We all have too much stress in our lives. My minis have provided a natural way of achieving a calmer demeanor. I’m sure my physician would only prescribe more of the same! Who am I to argue with that? to assure others the joy I have found in Llamas! Copyright © 2006- Gemini Mini Llamas. All rights reserved..